She'll be as cool as a breeze in the Stella McCartney Kids™ Reversible Palm Leaf Jacket. Banded, crew neck reversible jacket for desired wear and look. Leaf patches and sleeve detail on side one. Palm leaf print throughout side two. Straight cut bottom ribbed hemline. Lining: 71% polyester, 29% cotton. Details: 99% polyester, 1% elastane. 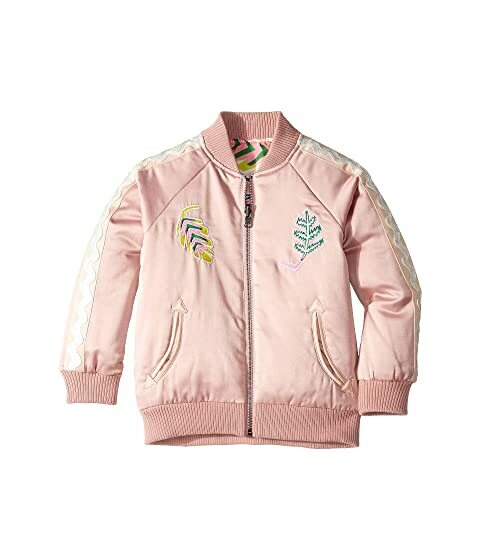 We can't currently find any similar items for the Reversible Palm Leaf Jacket (Toddler/Little Kids/Big Kids) by Stella McCartney Kids. Sorry!